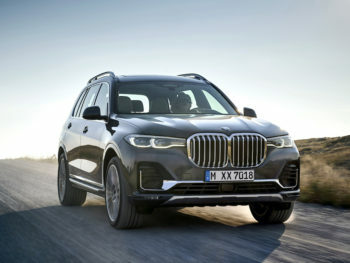 BMW has added a new flagship X7 model to its SUV line-up to bring the fight to the Range Rover and Mercedes-Benz GLS. On sale from March, depending on the market, the new seven-seater puts the focus on practicality and versatility while also bringing “unrivalled” luxury, like that seen in the 7 Series, to the large 4×4 segment. Practical features include two full-size seats in the third row with the option of two individual seats for the middle row instead of the standard bench. Middle-row seats – either bench or individual – can also slide forwards and back electrically and tilt forwards to aid third-row access. Boot space ranges from 326 to 1,210 litres while standard air suspension allows the car to be lowered at the touch of a button to make loading easier. The X7 also comes with a two-section split tailgate, both elements of which have electric opening and closing as standard. Standard equipment includes a three-part panoramic glass roof along with 10-speaker sound system, wireless mobile phone charging, four-zone automatic climate control, part-leather trim, heated seats, a sports leather steering wheel and the BMW Live Cockpit Professional, which includes a Control Display and a fully-digital instrument cluster – each with a 12.3-inch screen. An M Sport model is also available. Options include five-zone automatic climate control, Ambient Air package, Panorama glass roof Sky Lounge, controls with glass applications, Bowers & Wilkins Diamond Surround Sound System and Rear-seat entertainment Professional. In Europe, three versions are available from launch: a six-cylinder petrol engine for the xDrive40i and a pair of six-cylinder in-line diesels to power the xDrive30d and M50d M Performance models. The entry-level model is the 265hp xDrive30d, which brings an official combined 6.8-6. 5/10 km and 171-178g/km with a 0-100kph time of 7.0 seconds and a top speed of 227kph. The X7 xDrive40i offers 340hp and 9.0-8.7 l/100km combined with 198-205g/km and a 0-100kph time of 6.1 seconds and a top speed of 245kph. At the top of the range in Europe is the 400hp X7 M50d with 7.4-7.0l/100 km and 185-193g/km. It offers a 0-100kph time of 5.4 seconds and a top speed of 250kph. Outside of Europe, the 462hp X7 xDrive50i will provide a range-topping model with 11.4l/100km and 261g/km along with a 0-100kph time of 5.4 seconds and top speed of 250kph. All fuel, CO2 and performance figures are provisional. All units are married up an eight-speed Steptronic transmission and xDrive all-wheel drive while an M Sport differential is fitted as standard on the BMW X7 M50d and in conjunction with the optional Off-Road package.